Last week, looking for some information about Maersk I read that some Maersk vessels aren’t able to cross the Panama Canal because of their size. In a few months, these vessels and many more will be able to cross it. Panama Canal is located in the middle of the American country, between the Pacific Ocean and the Caribbean Sea. Its length is 78 kilometers and it’s one of the most important Canals in the world. In 1880 a French company tried to build it but it failed. After that, on August 15, 1914, it was officially opened. Along its construction over 30,000 workers died and it cost approximeately 400 million dollars. This Canal makes faster the comercial interchange and relatively reduces costs between the two oceans. Until today, its five main users have been the United States, China, Chile, Japan and South Corea. Nowadays and since 2007, it is being carried out an expansion project which will allow crossing of bigger vessels along the Panama Canal. So, this project will speed up the worldwide transport. Since the project started there have been a lot of problems, recently its construction was completely stopped because of the lack of liquidity. Construction of two new lock complexes, one on the Atlantic side and another on the Pacific. Locks raise ship from sea level up to the level of inland waterways, they are wider and more efficient. Excavation of new access canals to the new locks and widening of existing navigational channels. Deepening of the navigation canals and elevation of the operational water level of Gatun Lake. 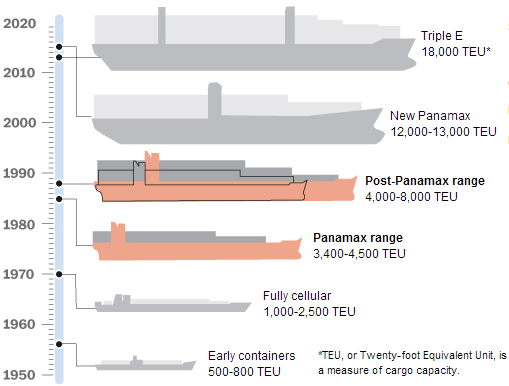 New Panamax ships will be the largest that can cross the new locks. And new U.S ports are being prepared for Panamax vessels. The Panama Canal expansion project is expected to be finished in 2015 and people talk about 1,600 million dollars, an incredible cost!! Since its inauguration about 1,000,000 vessels have crossed it. The tonne cost is 2.20 dollars. The Maersk Dellys established a new tollbooth record – 274,590 dollars on May 8, 2007. With the excavation rests we could built a replicate of the Great Wall of China from San Francisco till New York. The average is about 12,000 vessels a year. The cargo record was on December 15, 1981. An Arco Texas vessel loaded 65,299 tonnes of oil. From my point of view, this project could suppose an enormous change in logistical transportation but I also think it’s a very expensive project which has a lot of dirty rags behind. 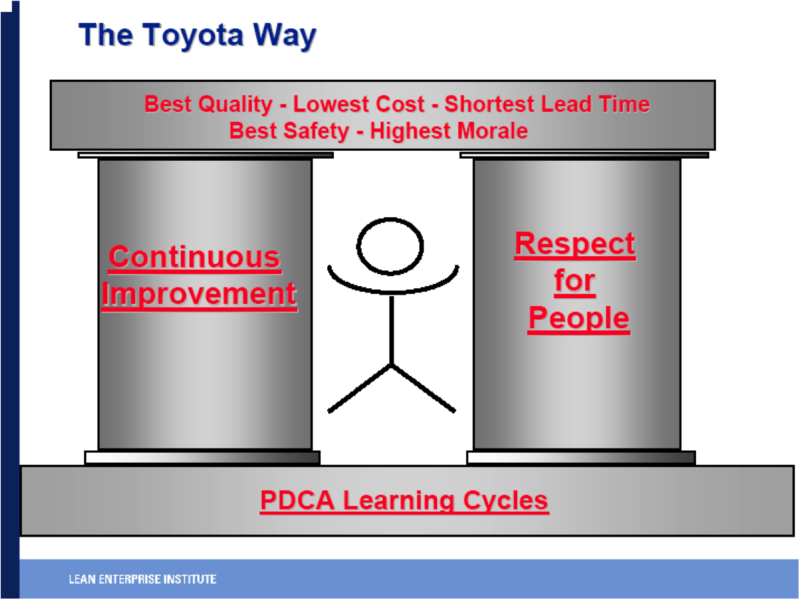 Toyota´s Philosophy has always been: customer first and Quality first ever since its founding. It is known as the guru of Total Quality Management based on the unchanging principles. Despite all this well skilled steps to follow. How did Toyota engineered its downfall? why wasnt it able to replicate its DNA, what damaged its brand significantly? LA is home to two large ports, which collectively would make the 8th largest port in the world. The story of the port industry in LA is an interesting one, full of corruption, swindling, and cut-throat competition. In the late 1800’s, docking in Los Angeles was a detested necessity. The port in San Pedro was in a difficult area with heavy waves, shallow mud flats, rocky shores, and overall very difficult access. Access required careful attention, and even rowing the giant boats into shore to avoid damaging the propeller. Furthermore, getting to the main transit areas from San Pedro was difficult, which was why Collin P. Huntington called for the construction of a railroad to connect and save transportation costs. However, Huntington’s purpose was not to spread these savings to the transport companies, but instead keep them for himself. As cargo was being transported across his rail line, he would go so far as to check the books, and see the value of the cargo to best squeeze every penny he could. Normally, the cargo would cost more to move the 25 miles from San Pedro to Los Angeles than the 7,000 miles from Hong Kong to San Pedro, but due to Huntington’s monopoly, few alternatives were available. Eventually, competition emerged to challenge the railroad tyrant, which led to a vicious price war. Huntington’s deep pockets allowed him to charge low prices for long enough to bankrupt the competition, and buy them out. Huntington sought to further monopolize the California port industry with a new construction in Santa Monica. However, the citizens revolted, causing a grass-roots backlash that made its way to the California congressional floor. After bribing, swooning, and lobbying, Huntington won the first fight in the house, but eventually lost support in the senate, causing his port monopoly to come to an end. With laxed importation standards, the popularity of the ports surged as with the commerce in Los Angeles. Santa Monica restored construction of piers, letting way for the famous Santa Monica Pier. 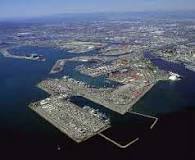 Long Beach became a sprawling city with a giant port, and Los Angeles remains the number one choice for transporting into Western United States. If the story had unfolded any differently, the face of Los Angeles would look quite different. Sometimes parcels need to be sent back. The Australia post company designed the parcel return service to be easy, hassle-free, and good for your business. The customers will have flexibility in how they return items, and that’s something they’ll be pleased with. eParcel Returns enables you to manage your returns and delivery through eParcel, Australia’s largest business to consumer parcel delivery service. If you want a basic, untracked returns solution, the Return Paid Parcels service is available, which makes it easy for your customers to return items to you. Reading BARBARACE´s post Why is the road transport so expensive?, I wondered which technical systems exist to prevent from theft and pilferage as well as from loss of goods. In the United States an estimated $30 billion in cargo is stolen annually. Several methods are needed to reduce the danger of being robbed. The problem is that there are many stages criminals can get active, and organized gangs have a lot of tricks. Production sites are one of the first stages where criminals can get active within the supply chain, for example by breaking in the facility or observing trucks being loaded with valuable goods. Therefore distribution centers are a favored spot, because usually many goods are shipped there. Of course outside these seemingly safe areas the streets are potential crime scenes for thieves. Stealing the truck when unattended at a rest stop or paying the driver to “look away” are just some handles to get the desired goods. An unconnected trailer at the side of a street can be hooked up by a truck by criminals within minutes and towed to a “secured location”. These are just some examples, but as you can see there are many situations thieves can get active. Caused by the economic damage by theft and pilferage some systems have been developed to improve facility and vehicle security. By GPS-tracking a warning system alerts the shipper as soon as a truck leaves a specific area or route. STASUPV recently posted about the MAN Telematics System, which is a example for a suitable technology. Of course also physical utilities are suitable. There are locks to secure vehicle and cargo, a kingpin lock to avoid the trailer being stolen, seals to limit intrusion. Camera-systems at transshipment-centers can record every incoming and outgoing shipment. 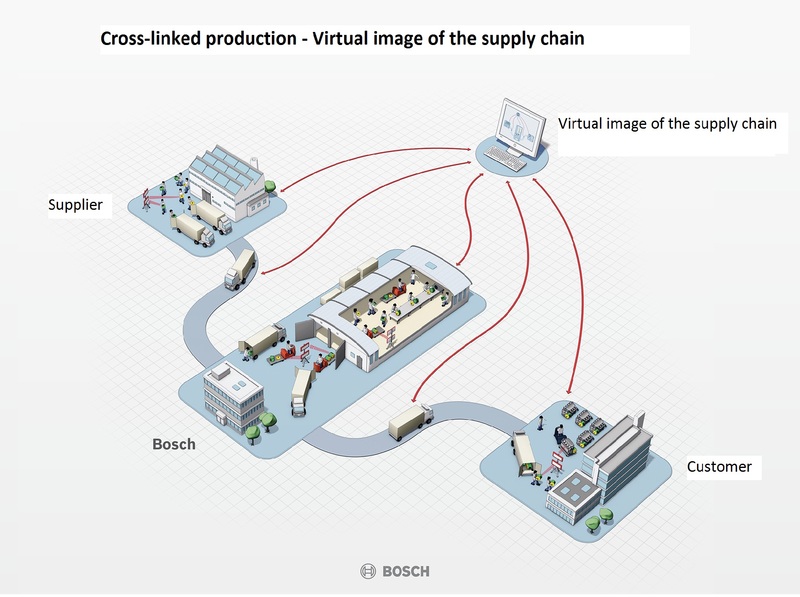 An automated software by BOSCH Security Systems links the scanning action of a good with recorded video-material, so any damage or loss of goods can be tracked. The damages by theft will never disappear, but as criminals are working on new methods to organize robbers, experts constantly work on new methods to fight against that. As Li has talked in his post about the containers and its importance in the globalization, I have found interesting to type about shipping in logistics and the latest news related to the containers and basically with shipping as well: a scanner to automate container code tracking. But first, I would like to explain a little bit what involves shipping and logistics. It involves managing the transfer of products from the place of their origin to the place of their consumption. It includes activities such as material handling, warehousing, packaging, transportation, shipping security, inventory management, supply chain management, procurement, and customs service. Basically, as we can guess, in most industries this kind of transportation is part of their supply chain and value chain. As Li posted, globalization and outsourcing are important trends nowadays and they are the core value in Logistics and Shipping industry. Because of this that any mistake can turn wrong the best business. From Australia, a known technology company, Honeywell, has announced that Australian shipping industry is using scanners to track containers in real time and reduce errors in data capture. 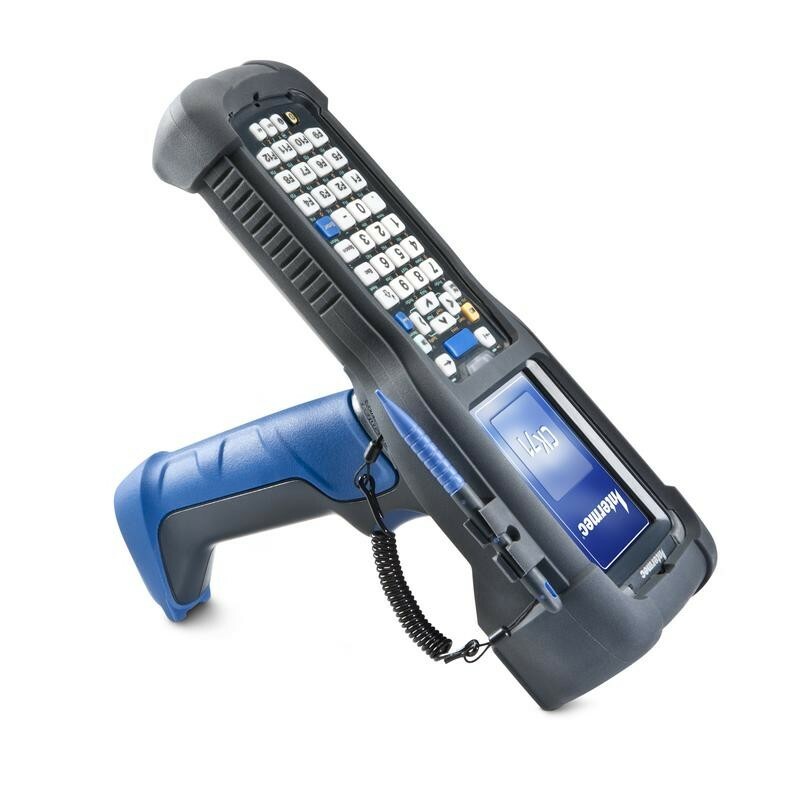 As the Global Logistics Media magazine explains, with this instrument, shipping companies can scan and automatically read shipping container codes and numbers from a distance of up to five meters. The team of Honeywell has introduce a software-based imaging solution what allows to automate data collection by using OCR (Optical character recognition) technology to scan letters and numbers in shipping containers instead of manually. It means to improve the accuracy of container tracking and saving employee time. Somebody once said that: the containers change the shipping economic rules, thus change the trade flows. Without the containers, there would not be the globalization. What is it about the container that is so important? Surely not the thing itself. The value of this utilitarian object lies not in what it is, but in how it is used. The container is at the core of a highly automated system for moving goods from anywhere, to anywhere, with a minimum of cost and complication on the way. 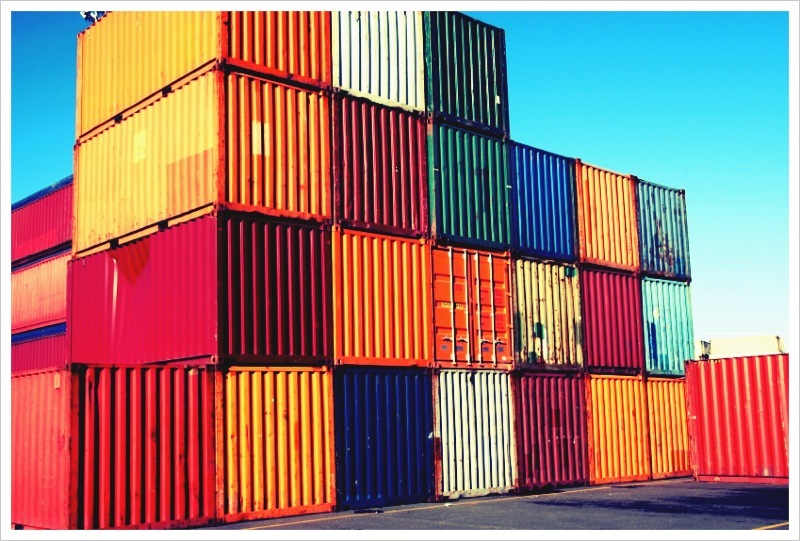 The container made shipping cheap, and by doing so changed the shape of the world economy. The container is a standardized reusable steel box used for the safe, efficient and secure storage and movement of materials and products within a global containerized intermodal freight transport system. According to the goods loaded in: dry cargo container, dry bulk container, tank container, etc. According to the making material: wooden container, steel container, stainless steel container, etc. According to the structure: flat rack container, open top container, etc. 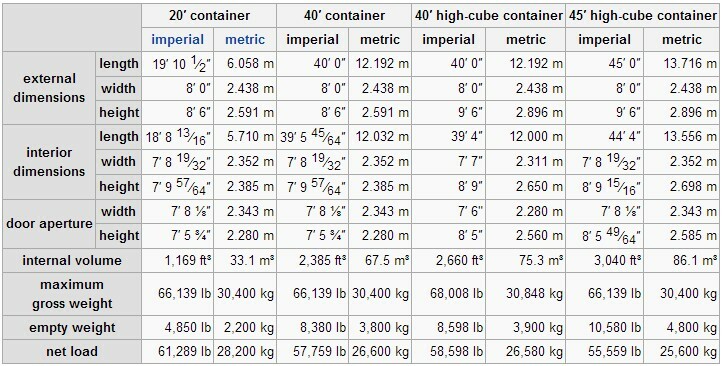 According to the whole weight: 2.5tons, 5tons, 10tons, 20tons, etc. It is worth noting that the twenty-foot equivalent unit (often TEU or teu) is an inexact unit of cargo capacity often used to describe the capacity of container ships and container terminals. Door to door, Door to CFS (container freight station), Door to CY (container yard), CY to door, CY to CY, CY to CFS, CFS to door, CFS to CY, CFS to CFS.